Yesterday’s blasts on Moscow Cherkizovsky market were supposedly organized by members of a nationalist or fascist group. They decided to bring the bomb to the market and explode it with a goal to “kill non-Russians.” Moscow police have already arrested three suspects and their accomplices, including the group leader. The officers have also searched their flats and found considerable amounts of explosives there similar to those used during the market blasts. Moscow's top prosecutor said Tuesday that a bomb blast at a Moscow market that killed 10 people was most likely a hate crime, the Interfax news agency reported. The Monday morning blast hit the Cherkizovsky market, where a large number of traders come from Asia or the Caucasus regions - both ethnic groups have been victims of a growing wave of hate crimes in Russia. Moscow Prosecutor Yuri Syomin said Tuesday belief that the attack hate crime targeting ethnic minorities "is one of the theories and now is the dominant one," Interfax reported. Two suspects have been detained and reports say they are believed to be members of extremist organizations. Russian Prosecutor General Yuri Chaika told reporters on a trip to Tajikistan Tuesday that five of those killed in the blast were Chinese and one was from Vietnam, the AP says. However, Chaika said "now there are two working theories - it could be a terrorist act or it could be a criminal dispute," RIA-Novosti reported. 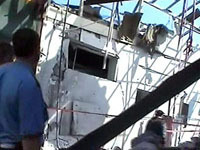 Prosecutors on Monday opened a murder investigation in connection with the explosion. Under Russian law, terrorism is a separate offense.